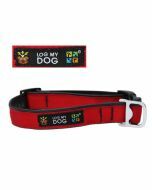 Make your dog trackable with this fun Log My Dog tag! They are fully trackable at Geocaching.com, each with a unique tracking number so you can follow their travels. Designed to withstand the extra wear and tear from life on a collar each tag comes with a simple split ring attachment. This lightweight tag measures 28mm. The design features Signal's dog "Tracker". *Based on feedback from the community, we have updated the design to a full etching on both sides to insure rugged durability.